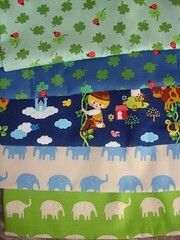 Superbuzzy: One of the biggest selections of japanese import fabrics that I find nearly irresistible. Reprodepot You can find a smattering of japanese import fabrics here, but also many vintage reproduction fabrics (hence the name). i am also a bg fan of their numerous apron patterns. J. Caroline Creative This is an awesome one-stop online fabric shop. They have my favorite fabric designers (Alexander Henry, Michael Miller, Kaufman) and a fantastic selection of canvas, duck cloth and corduroy. The notions that have are super-useful too – magnetic snaps, ribbons, and purse handles to name a few. One Response to "Gifts for the crafty – Part ii – Fabric"